The pilot of a new Airbus plane for Iran Air waves a national flag after landing at Mehrabad airport, Tehran, Iran, Jan. 12, 2017 (AP photo by Vahid Salemi). Last month, at a ceremony in Toulouse, France, the French firm ATR officially gave four passenger planes to Iran, and the planes were flown to Tehran the following day. The ATR 72-600s are the first of a 20-plane deal made with the firm following the 2015 nuclear deal and lifting of sanctions, according to the Associated Press, and their purchase is part of a larger effort by Iran to update its commercial fleet. 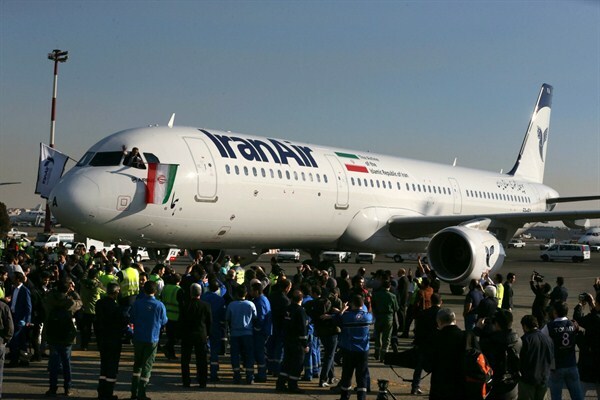 In an email interview, Bijan Khajehpour, managing partner of the Vienna-based consulting firm Atieh International, describes the current needs of Iran’s aviation sector as well as the obstacles that remain to meeting them.